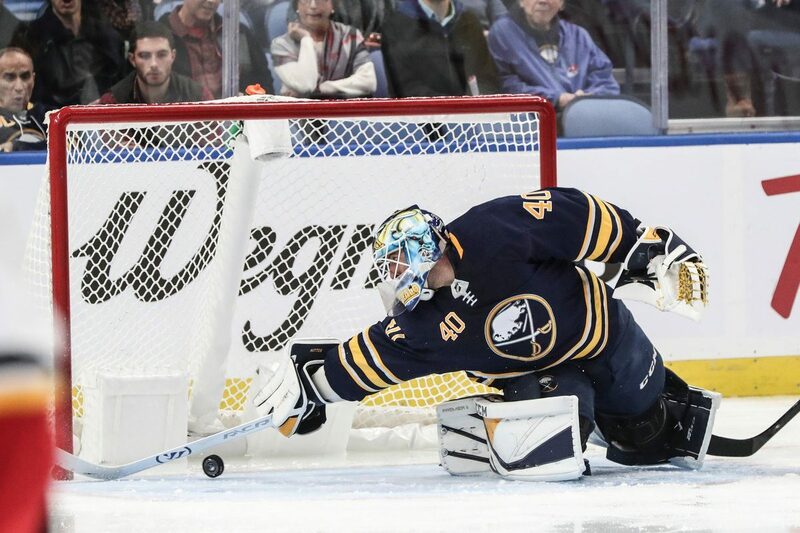 After stowing his skates into an overstuffed equipment bag, Carter Hutton smirked and summarized another Buffalo Sabres high-wire act in a way only a goalie could. Hutton, making his second start in five games, again was subjected to a few dangerous scoring chances because of lapses by his teammates. But it was one of their finer defensive performances in weeks. It also was Hutton’s best game in some time. The 33-year-old goalie said his confidence was not shaken by losing 10 of his previous 12 starts, however, he ackowledged his latest start was worth more than two points in the standings. “I think it’s a big step forward for me to regain and get back to that competitive edge,” Hutton said inside an empty visitors’ dressing room. Hutton did not think he was at his best against the Blue Jackets. He wished he could have the third goal back when he was unable to prevent Brandon Dubinsky’s awkward shot attempt from rolling slowly over the goal line. This wasn’t Hutton’s stiffest test to date, either. Though Columbus’ offense can be dynamic, the Sabres limited the Blue Jackets' chances to the perimeter, particularly in the final three minutes of regulation. Still, Hutton made big saves in key moments, including his stop on Pierre-Luc Dubois’ point-blank, backhanded shot in the third period. There was also his save on Cam Atkinson with 15 seconds remaining. It was an important night for a veteran who was a catalyst for Buffalo’s 10-game winning streak. Hutton went 8-0 with a .936 save percentage during that span, despite the Sabres allowing a number of odd-man rushes. The struggles that followed – both for him and his teammates – led coach Phil Housley to turn to Linus Ullmark more often in the final weeks before the All-Star break. In his final start before the All-Star break, Hutton was pulled after allowing five goals on 12 shots in a 7-2 loss in Edmonton. Through all the losing, Hutton was open with reporters about what shots he should have stopped. "I thought I got back to the game I need to play," Hutton said. "It’s such a grind. I thought early on, last few games things weren’t going my way, but I don’t think I was helping myself. I was being too passive. I’m not a great goalie when I’m a passenger. I need to be aggressive and on top of things. I thought tonight I did a better job of getting on top of pucks and competing better." The All-Star break was an opportunity for Hutton to “refresh.” After all, it was the first time he played so many games during a season’s first half. On this date last season, Hutton had gone 13-4-1 in 22 appearances with St. Louis. He already has appeared in 32 games this season, posting a 15-14-3 record. Despite playing behind a young team, Hutton’s save percentage (.911) ranks ninth among 20 goalies with at least 30 games played -- tied with Las Vegas’ Marc-Andre Fleury, albeit in 13 fewer games, and better than the New York Rangers’ Henrik Lundqvist. Hutton, who signed a three-year contract with the Sabres in July, has allowed 13 goals in his last three games. He is 3-8-2 with a .898 save percentage since the 10-game winning streak ended, though his defense is also responsible for that regression. Scoring is up across the NHL. Even the best goalies are struggling with consistency, including Columbus’ Sergei Bobrovsky. That trend is exacerbated with a young team such as the Sabres. Through it all, Hutton has remained the same passionate leader who helped the Sabres rise to first place in the Atlantic Division two months ago.